It’s a common dilemma: you want to have a signature cocktail at your wedding during your super-fabulous cocktail hour, but your bartenders are your brother’s friends from college. You love them dearly but also know that there is no way they can froth, swizzle, and shake drinks to order, and keep the drink line moving. In fact, even your hired bartender probably doesn’t want to muddle a hundred drinks in an hour (unless you’re having say, a craft bar wedding, in which case please invite us). There is a practical solution here, which is pre-batching your drinks so that your bartenders only have a couple of steps to mix each drink. These are big batch cocktails, or pitcher cocktails. They allow bartenders to move quickly and let you make sure each drink is balanced without working too hard. Here’s how it’s done. That means: no muddling (though we’ll be showing you a muddling cheat soon, hang tight for that), no flames, no egg white frothing, no “rinses,” no blended drinks. Select drinks that can be made ahead of time. 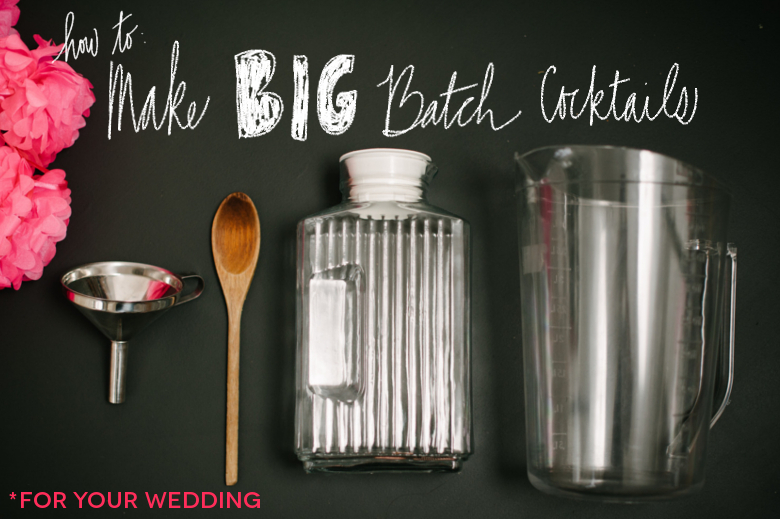 The key is to create a cocktail base that you can make in a large batch, and then on the day of your wedding, your bartender just needs to shake your mix with ice and pour (and possibly affix with a prepared garnish). This is easy. It’s a simple matter of multiplication and a couple of special supplies. First, look at your cocktail recipe, and multiply the recipe by the number of cocktails you want to provide. Keep in mind, most cocktail recipes are simple ratios, with this Brooklyn being an example of an 8/4/1/1 ratio (or, if you rock the fractions, 2/1/.25/.25). You may need to do some math at the store when you are buying your booze. Unfortunately, some spirits are sold in ounces, others in liters, others in quarts, pints, or gallons. I highly encourage using this smart phone app, or this one, or this website for your conversions. A NOTE ON GARNISHES: We’ll be doing a more in-depth post on batching garnishes and preparing the bar, but an easy cheat for a Brooklyn is to garnish with a cherry. Drop one in, and you’re done. Voila! Large (4 quart or more) liquid measure pitcher, available at Smart&Final, Cash&Carry, any restaurant supply shop. Or here. About $10. Your standard four-quart pitcher will hold 128 ounces at a time, so you’ll mix together four smaller batches to serve a hundred cocktails. First, fill your large pitcher with 50 ounces of rye or other whiskey. Then add 25 ounces of dry vermouth, then 6.25 ounces of maraschino liqueur and 6.25 ounces of AmerPicon. Stir your concoction, and taste it to make sure it tastes right. If it’s not quite right, adjust to taste. (Pro tip: make yourself a single serving of the cocktail before you start, and tweak it till you get the proportions the way you want them. That way you’ll have a standard to aim for with your big batch.) Give the whole thing one last good stir, and then use your funnel to fill each carafe (leave a little space at the top). Repeat three more times. Be sure to taste each batch as you go. Keep your vessels in a refrigerator or on ice at your bar, until cocktail hour. Be sure to provide either a stirring spoon for your bartenders, or make sure that your storage vessels can be shaken without leaking. Your mix can settle and will definitely need a shake-up before it is poured out. After that, your bartenders can just add your mix to a cocktail shaker with ice, pour it, and serve! If you batch your cocktails offsite and are planning to transport them to your venue, be sure to check your state’s laws regarding open containers in vehicles. In many places, keeping them in the trunk is fine, but make sure you are transporting your booze legally! Arrested best men and ladies are no fun for anyone. Dana went to Tufts University in Boston. Now she lives in San Francisco, where she can often be found harassing her dog, organizing her clothes by color, and perfecting her cocktail party tricks.